When a crisis hits a country, should it shut the door to migrants? Migration is an important and sensitive topic today. 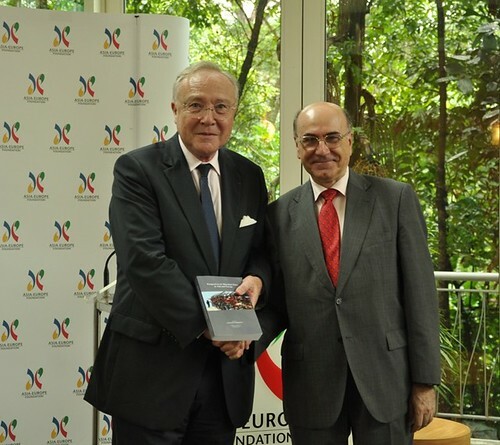 Professor Antonio Marquina, leader of the ASEF-supported ASEM Education Hub Thematic Network on Human Security, will kick off the panel discussion with the presentation of the latest book he has edited, Perspectives on Migration Flows in Asia and Europe. This publication is the third in a series by Asian and European scholars, after publications on energy security and global warming. Prof Marquina analyses political, economic, social and environmental trends which prevent countries in Asia and Europe from stemming the flow of migrants. Factors that have played an important part include an ageing domestic population, the effects of the economic crisis, migration caused by environmental degradation and the exodus of political refugees. The Panel includes discussants Dr Aris Ananta of the Institute of Southeast Asian Studies (ISEAS), Dr Md Mizanur Rahman of the Institute of South Asian Studies (ISAS) and Dr Reuben Wong of the National University of Singapore (NUS). They will further examine this topic by commenting on the analyses by scholars and experts published in this book. When a crisis hits, should a country shut the door to migrants? This was the question the Asia-Europe Foundation (ASEF) posed at a panel discussion, Too Many Foreigners? Crises and their Impact on Migration Flows, organised jointly with the Embassy of Spain. The topic comes hot at the heels of rising migrant levels, growing anti-immigrant sentiment and migration trends, all of which have become sensitive issues in many countries. Addressing this topic at a public panel discussion held on 11 October 2011 at ASEF were: Professor Antonio Marquina from the Complutense University of Madrid; Dr Aris Ananta, Senior Research Fellow at the Institute of Southeast Asian Studies; Dr Mizanur Rahman, Research Fellow at the Institute of South Asian Studies; and Dr Reuben Wong from the National University of Singapore. The panellists noted that Europe had seen a rise in far-right, anti-immigrant sentiments and that leaders from France, Germany and the United Kingdom had also rejected the multiculturalism model. With another global financial crisis looming, many governments are now considering tightening immigration policies, limiting the entry of “newcomers” to their door. However, Prof Marquina observed that artificially stemming the flow of migration in the short and medium term would be “untenable, if not impossible”. Prof Marquina earlier presented the book Perspectives on Migration Flows in Asia and Europe, in which he analysed political, economic, social and environmental trends that prevented countries in Asia and Europe from stemming the flow of migrants. Commenting on the book, which is the result of research by Asian and European scholars, Dr Ananta agreed that migration was here to stay. “Whether we like it or not, the rising migration flow is unstoppable,” he said. He added that with globalisation and the trend of free trade and free movement of capital, the freer movement of labour was to be expected. If free movement of labour was artificially prevented, it would most likely result in a black market of clandestine labour. Dr Ananta also highlighted that the definition of “foreigners” differed from country to country. In some places, even the offspring of second and third generation local residents could still be regarded as foreigners as they did not qualify as citizens of that country. In other situations, local residents were unhappy with “newcomers” who could also have become new citizens. Nevertheless, migration patterns were affected by demographic trends, such as an ageing population. According to Dr Mizanur Rahman, who has researched on migration in South, East and Southeast Asia as well as the Middle East, governments responded differently to the same groups of migrants. In some cases, these policies included “isolating” foreign migrants from the local population and in other cases they involved imposing annual entry quotas. However, Dr Reuben Wong argued that governments should consider policies on mitigating the side effects of migration, which are potentially bad ones. “Migration can’t be stopped, so governments and their policy responses have to get used to it,” he noted. Perspectives on Migration Flows in Asia and Europe, a collection of analyses on migration written by Asian and European scholars is the third in a series, after publications on energy security and global warming, produced by the ASEM Education Hub Thematic Network on Human Security, which was supported by ASEF. A copy of this latest study was presented by Prof Marquina to Ambassador Federico Palomera, who received on behalf of the Embassy of Spain; and to Ambassador Michel Filhol, Executive Director, who received on behalf of ASEF.